This Couple’s Baby Died 9 Hours After Delivery & They’re Going to Jail..
Dale and Shannon Hickman are 30 year old grieving parents. But they were both convicted in 2011 of second-degree manslaughter for the death of their son, David, who died nine hours after his home birth in 2009. Last week a judge rejected an appeal made by the couple, saying again that they could have done more to try and save their son. Their son David was born two months premature with undeveloped lungs and a staph infection he’d gotten from his mother while she was pregnant. He died after having trouble breathing and turning blue. The Hickmans are both members of a faith-healing church in Oregon that is clouded in controversy. As you’ll hear in the video above, its members have an unusually high number of child deaths due to their faith-healing practices. The appeal the Hickmans made last week was based on their conviction, on the grounds that the prosecution had the burden to prove the couple knew their religious beliefs would cause the death of their child, The New York Daily News reported. During the couple’s 2011 trial, a doctor testified that baby David would have had a “99 percent chance” of surviving had the couple called 911 or a doctor. The baby officially died of staphylococcus pneumonia, which could have been treated. Mr Hickman said he didn’t call 911 because he was praying. 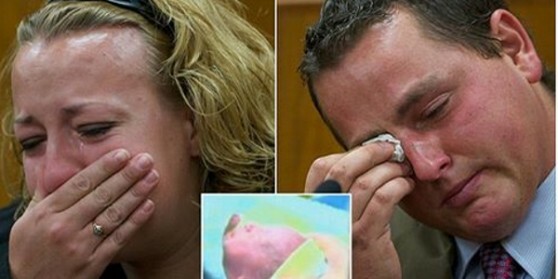 The couple never considered taking the baby to the hospital, prosecutors said. Instead, they annointed the sickly baby with oils. Shannon Hickman said that she had no choice but to do as her husband said because of church rules. The Hickmans’ conviction on second-degree manslaughter charges typically requires a mandatory minimum sentence of six years in prison, but because of a religious exemption in state law which hadn’t expired in 2011, they may only receive 18 months in prison and a $250,000 fine. Two other parents from the church were convicted earlier this year for failing to seek medical care for their infant daughter. She had a growth that could have left her blind in one eye – and they were sentenced to three months in jail. This post was republished from firsttoknow.com. You can find the original post here.